A engineer by profession, Allan Hartley has spent the majority of his working life overseas engaged on major construction projects. Throughout this time, however, he has maintained his close links with Austria, which he discovered totally by accident in the early 1970s in respite from atrocious weather conditions in the higher mountains of the western Alps. He maintains that Austria and the Dolomites of neighbouring Italy remain one of mountaineering's best-kept secrets, with their heady mix of superb scenery, good huts and first-class food, and that they are areas better suited to the average mountaineer than the higher mountains to the west. 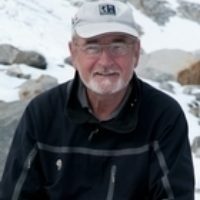 In addition to Austria, Allan has climbed extensively throughout the Alps, in east Africa, the Falkland Islands and the Greater Ranges in Nepal and Pakistan, as well as in lesser-known areas such as the Zagros mountains of Iran and, more recently, the Hajr mountains of the Arabian peninsula. Not surprisingly, Allan is a long-term member of the Austrian Alpine Club, as well of the Outdoor Writers and Photographers Guild, an Associate of the Royal Photographic Society and a holder of the International Mountain Leaders Award. When not abroad, his home is on the edge of the Yorkshire Dales.